Marta Suplicy is the new mayor of Sao Paolo, Brazil -- a breath of fresh air after years of municipal apathy and corruption. Her aim is to make Sao Paulo a sustainable 21st century global city. This program, the first from the City Life series, follows Marta as she visits schools, hospitals, favelas, and a shelter for battered women, in her quest to turn the city around. Interviewed in the program are Professors Peter Marcuse (Columbia University), Saskia Sassen (University of Chicago), Ed Glaeser (Harvard University), as well as Sheela Patel, director of SPARC (Society for Promotion of Area Resource Centers), and Anna Tibaijuka, the Executive Director of the United Nations Center for Human Settlements. 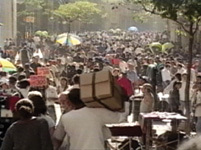 The producer of this program has collected extensive resources at www.tve.org/lifeonline/index.cfm?aid=1033.